Here’s a few words on some of my favorite stories. And I had a lot of favorites, so I’m splitting this review into two parts. Enjoy and stay tuned! Intensely imaginative, “Courtship in the Country of Machine Gods” by Benjanun Sriduangkaew is one of the strangest stories I’ve ever read, and certainly one that was a challenge to wrap my head around. The first time I read it I was entranced by the beautiful prose. So entranced, in fact, that I neglected to pay attention to what was going on. And what’s happening unfolds so very quietly. Against the background of colonialism, hostile takeovers, and mathematics as meditation is a love story. In a land where the denizens pray, dream and meditate in pure mathematics, can a love affair subsist on destiny, or even luck? Something has gone very wrong with Kanrisa’s engineering, and it’s hard to fix what’s been made illegal. And to my human eyes, would I even recognize what “she’s fixed” even looks like? The imagery in Courtshi . . . is both precise and vague. I can tell you generally what’s happening and a few details of what things look like, but big picture wise, I think every reader is going to envision something different. Translated by Ken Liu, Jia Xia’s “A Hundred Ghosts Parade Tonight” is a completely different tone than “Courtship”, it’s far more playful and whimsical, but even from the start you know something strange and dark is going on, the narrator, Ning, he’s not telling you half of what he knows. It’s festival night on Ghost Street, and Ning is the only mortal, so the ghosts dote on him. Abandoned at Ghost Street as an infant, the story has a sort of Gaiman Graveyard Book feel to it. Everyone knows Ning is growing up, soon it will be time for him to be with his own kind. He’s been raised by Xiao Qian for so long, she doesn’t want to give him up. Maybe it’s not that, maybe she just doesn’t want his heart to break when he learns the truth. With fantastical visuals, compelling characters, and clipped conversations, this was a story I kept coming back to to see what more I could parse out of it. One of my instant favorites was “Act of Faith” by Fadzlishah Johanabas. I always like that trope of person gets a robot, hates it, comes to realize the robot means them no harm. And this story takes that trope into a flat out brilliant direction. Doud is getting older, and his son is away from Earth too much to help care of him, so his son buys him a household robot. Of course at first, Doud hates the robot. A man of immaculate manners, Doud doesn’t want to be rude, so he names the robot Sallehuddin, and insists that Sallehuddin call him Abah (father). Salle is programmed to adapt its behavior and speaking to become more acceptable to its human owners. A devout Muslim, Doud begins teaching the robot Arabic, and how to read the Koran. okay, so what’s happening here? Is Salle just doing what Doud asks him to do? Can a robot have a soul? Is a soul something we’re born with, or something we develop and curate, something we program? You know that intimate connection you get when someone is brushing your hair? The conversations and dialog in Act of Faith felt like that: caring and gentle, and with hopes it wouldn’t stop. It was just a truly beautiful story. “City of Silence” by Ma Bayong was another favorite. A 1984esque piece, complete with a controlling police state, propaganda, doublespeak, and the individuals who crack under the pressure. First, the State published a list of forbidden words, and as the list got longer (and even reading it would make one guilty of using a forbidden word), it was just easier to print a list of acceptable, healthy words. This list gets shorter every day, and when leaving their homes citizens wear a listening device to ensure they speak and hear only healthy words. To Ardarvan, this life is completely normal – it’s all he’s ever known. He knows something is horribly wrong, but he hasn’t got the vocabulary to understand what annoyed, or depressed, or frustrated even mean. Psychological survival requires that people hack the system, and after solving a bit of a puzzle, he gains access to a secret club, where lists of words are left at the door. It was darkly funny to watch his reactions to a room full of freedom, and watching how it changed him, how it allowed something beautiful to blossom. But all flowers die. A biting statement against propaganda and police states, I think this story will speak to a lot of people. Are you hooked yet? Stay tuned for more! 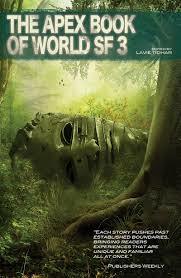 1 Response to "The Apex Book of World SF Volume 3, edited by Lavie Tidhar"
I have finally finished this one myself. Far and away the first story, Courtship in the Country of Machine Gods, was my favorite. Still thinking on a couple of others before I write some stuff down.